One of the aims of ECOWAS was to promote co-operation and integration. It was believed that this could lead to the establishment of a monetary union to stimulate economic activity and achieve stability. Secondly, the community aimed at ensuring the elimination of customs duties, import and export duties that are charged at the various entry and exit points among the member countries. Thirdly, the community aimed at the harmonization of the policies of the member states so that programmes and projects in the sub-region can be integrated. Fourthly, the community's aim was to establish a common market, through the removal of the barriers to the free movement of goods and services as well as of persons. Another component of this was the adoption of common tariffs within the sub-region. Fifthly, the organization aimed at the promotion of joint ventures among companies of member countries in order to encourage investments across their borders. Sixthly, the organization aimed at the establishment of a fund, the ECOWAS Fund, to carter for the special needs of member states that might arise in the course of the implementation of the protocols of the the organization. Another aim of the ECOWAS was the encouragement of plans and policies to promote a balanced development across the entire sub-region. 1. a. Describe the Economic Community of West African States. b. Highlight five aims of the formation of the community. 2. Explain six fundamental principles governing the Economic Community of West African States. 3. a. What is the composition of the Economic Community of West African States? b. 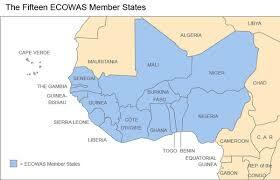 Give five reasons why the West African countries find it necessary to establish the ECOWAS?